When I told my girls that we were going to bring along a tea set, they were excited but also a little doubtful. “The boys aren’t going to want to play tea,” they said. “I know, but we’ll bring it anyway.” I replied. And so we headed off to the country, to visit my friend Tricia. It was a beautiful spring day, with blue skies and fluffy white clouds. Tricia and I met when we were both teaching in a small town. She had just moved up north after a break-up with her fiance, and I had just left a two-year relationship. I was assigned to be her “mentor,” but she mentored me just as much as I mentored her, and a frendship grew. I would drag her out of her apartment when she was going through her agoraphobia phase. She came with me to the doctor when I was afraid I had cancer again. (I didn’t.) We helped each other with just about everything, including moving from one apartment to another. Once, we put my full-sized mattress in back seat of her convertible and drove across town. The mattress was sticking straight up in the air, and I sat in back holding the door closed since the mattress was too wide for the car! But then it happened. We met our respective husbands and went our separate ways. Well, I went my separate way. Tricia stayed in the same town, but I moved 60 miles away to live with my husband. Tricia has always been much better than I am at staying in touch. She never fails to call me on my birthday. We’ve met at the county fair and apple orchards. After she started her photography business, she had a great idea. We should do a blog swap! She wanted to take pictures of my girls, and so one day in May we drove out to see Tricia and her boys. She greeted us at the door wearing her lucky green tank top, and in their excitement her two sons pushed past her to greet us. They had grown so much since the last time I saw them! They led us to a grove of poplar trees where Tricia had a frame set up. Not only had I brought a tea set, but I also brought a little piece of my mom with me. We draped the quilts my mom made over the frame, making a tipi. There was a gentle breeze which kept the air from getting too warm, and I sat on the grass to watch Tricia work her magic with the camera. She knew just how to the put the girls at ease; they thought getting their picture taken was fun! About that tea set; the girls did indeed have a tea party with the boys. But you will have to visit Wigglebug Photography to see those photos. They are so cute! The pictures were so precious!! I love the tea party theme!!! Keeping in touch with good friends, and being able to have your kids play together, that is one of my favorite things about still living relatively close to my best friend. I can't wait to see more pics of the tea party! And I can so picture you holding that mattress in the car – too funny! It's always nice to have the kind of friend that lifts you up when you stumble and lets you do the same. My recent post Pinterest Saves the Day! Well I just love this…my sister-in-law did tea parties with all my boys! She had two sons of her own and then I started having my crew of boys…so she just had tea parties. God in his grace gave her three grand-daughters years later. 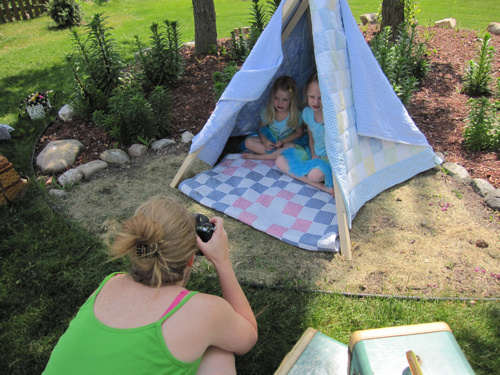 The boys enjoyed the years of the tea parties…and she even made them a tent like you have here. What a great time had by all..what precious memories…and what an awesome friend!! I love the story and the photos are BEAUTIFUL! Especially with your girls on your mother's quilts. Love it! It’s also nice to have that mutual “mentoring” between friends. That’s wonderful that you two stay in contact and remain such good friends! Personally I’ve had it go both ways when people move miles away. I too though am not the best at keeping in contact with others. It’s good to have patient friends. LOL! Anyways, I really enjoyed your post and I will definitely be sure to go check out your friends post now! My recent post AVON Calling? Oh How I Wish! It tuned out so cute! My friend Megan read it and said "she is a great writer!" She meant you NOT me 🙂 Thanks for blog swapping with me ! So cute!!! the pictures over there are wonderful. I love the quilts! My recent post Who googles this stuff? SO cute!! I love the tent made out of a quilt. Isn't it a gift to have friends with talent!! My recent post I'll oversing your praises! – and will eat some chicken!